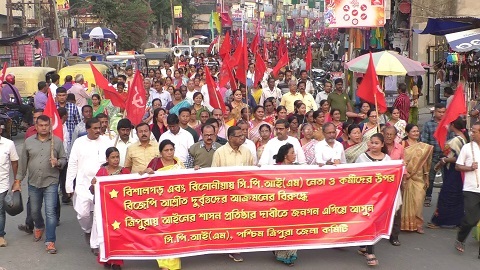 The main opposition party in Tripura, the Communist Party of India-Marxist (CPI-M) brought out a protest rally in Agartala on Saturday condemning the vandalizing of the vehicle of CPI-M MLA Narayan Choudhury and disrupting a meeting of the former Chief Minister Manik Sarkar a day ago allegedly by ruling Bharatiya Janata Party (BJP) supporters. On November 16, a meeting addressed by Manik Sarkar, leader of the Opposition, at the Bishalgarh CPI(M) office was allegedly encircled by BJP men, who tried to disrupt the meeting. Earlier, BJP miscreants had sought to prevent people coming to attend the meeting. On their return also, many participants were attacked. The second incident of vandalizing of the vehicle of the CPIM MLA occurred at Gokul Nagar Rastarmatha area under Bishalghar police station area. In this incident also the allegation is on the ruling BJP. CPI-M alleged that there have been a series of attacks on members of the Zilla Parishad. 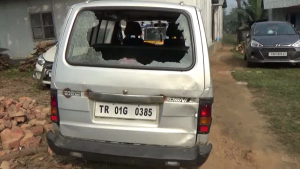 BJP goondas had attacked the house of South Tripura Zilla Parishad president, Himanshu Roy. Subsequently, on November 15, while proceeding to the Zilla Parishad meeting in Belonia town, BJP goons attacked the cars of Roy and other Zilla Parishad members. In the attack, some policemen were also injured. In protest of these continuous attacks on the opposition party leaders and supporters by the ruling BJP supporters, the CPI-M took out the protest rally. Former Deputy Speaker and CPI-M senior leader, Pabitra Kar alleged that BJP supporters wanted to vandalize the meeting of former Chief Minister Manik Sarkar on the occasion of November Revolution and in the attack, 40 to 45 cadres were injured besides the vandalizing of the car of MLA Narayan Choudhury. He added that only a day earlier during a meeting called by the District Magistrate of the Zilla Parishad at southern Belonia city, BJP supporters vandalized it. However, those attended the meeting were even not spared after they fled and took shelter in the police Superintendent’s office where they were attacked in front of the police. Kar said to restore democracy and peace they are organizing the protest rally. Meantime, MLA Choudhury said that though he could not identify the attackers, they were BJP supporters. He also said that he was not injured as one among the attacking team members had stopped a stick coming towards his head, however, his vehicle was not spared.